What Is the Periventricular Area? What Are the Symptoms of PVL? Will My Baby Develop PVL? PVL is one of the most important causes of cerebral palsy and other long-term handicaps. It is primarily seen in premature infants with the most prematurely born infants being the most likely to have this problem. It can only be identified by ultrasound, MRI scan or CT scan of the brain. PVL is caused by insufficient blood flow to parts of an infants brain before birth, at delivery, or after birth. Within the center of our brains are four small fluid-filled areas called the cerebral ventricles. The area just outside the ventricles is called the periventricular area of the brain. "Peri" means next to or around, so periventricular means next to or around the ventricles. This area contains important nerve fibers that carry messages from the brain to the muscles of the body. The periventricular tissue receives its blood supply from very small arteries in the brain. Changes in blood pressure or in the ability of the heart to pump blood throughout the body can result in a decrease in the blood flow to these small arteries. If the periventricular tissue does not receive an adequate blood supply, the tissue may die and dissolve, leaving a fluid-filled cyst in its place. When the nerve fibers that normally travel alongside the ventricle are damaged and are replaced with fluid, it is called leukomalacia (pronounced loo co ma lay shee uh). PVL is the occurrence of leukomalacia in the periventricular areas of the brain. Although the cysts are not dangerous in themselves, they indicate that nerve fibers from that region of the brain have been lost. There are no physical symptoms of PVL in the newborn period. Examining your baby will not determine if PVL is present. PVL can only be identified by ultrasound, MRI scan or CT scan of the brain. Premature newborns who have a risk of PVL usually have a head ultrasound done at about 30 days of age to look for PVL. The ultrasound test is the simplest brain-imaging test to perform. Even on a head ultrasound, CT scan, or MRI, PVL may not show up until a month or more after birth. Therefore, to identify PVL reliably, a head ultrasound or other test should be done at about four weeks after birth. The graph shows the incidence of PVL among very low birth weight children (birth weight 501-1500 grams [1 lb. 2 oz. to 3 lbs. 5 oz.]). The data were published by the Vermont Oxford Network and National Institute of Child Health and Human Development Neonatal Research Network.1,2 Birth weight is used more often than gestational age to measure survival because it is easier to get an accurate measurement of weight than of gestational age. The differences in the incidence of PVL in the two data sets reflect different time periods and patient populations. The "true" incidence is probably somewhere between the two estimates presented above. The data show that the lower the birth weight, the higher the risk for PVL.1 However, you cannot assess the risk of PVL in a specific baby by looking at the graph. For each patient, many factors may combine to affect the development of PVL, including low blood pressure, infection in the baby or mother, and prolonged periods of low oxygen levels in the baby's blood. It is very difficult to predict which babies will develop PVL. That is why doctors perform routine head ultrasound examinations on many premature babies. There is no specific treatment for PVL. Current research focuses on identifying risk factors and on preventing PVL. Will My Baby Have Long-term Problems from PVL? PVL is a leading cause of cerebral palsy in children. In 1995, Pinto-Martin, et al. 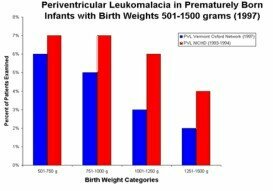 4 reported a 14.6% incidence of CP among infants with PVL whose birth weight was between 501-2000 grams. Infants with PVL who weighed 501-800 grams at birth had a 7 to 20% incidence of CP.5 The variation in outcomes is due to the variation in location, size, and extent of PVL. Infants with PVL have varying degrees of mental handicaps. Some may show normal intelligence and development. Most, however, have developmental delay and handicaps in their ability to think and learn. According to an assessment of 13 patients with PVL by Yokochi, 23% of the infants had severe mental retardation, 38% had moderate mental retardation, and 38% had mild retardation.6 Mental handicaps may also have been influenced by injury to other areas of the brain in these sick premature babies. Among babies with PVL, the type and severity of disability appear gradually over time. It is very important for babies who have been diagnosed with PVL to have frequent developmental assessments. What are my baby's chances of having PVL? Babies born prematurely who have had an intraventricular hemorrhage are at greatest risk for developing PVL. However, any condition before, during, or after birth that interferes with the blood flow to the periventricular tissue can increase the chances that your baby may have PVL. Your babys doctor will be able to tell you what risk factors your baby has. Can the damaged parts of my baby's brain regenerate? Unfortunately, lost nerve fibers do not regenerate. Your baby may learn how to compensate for the lost nerve fibers to some extent, but replacement does not appear to occur. Would multisensory stimulation improve my babys outcome? There is some evidence that massage therapy, range of motion exercises, and oral and visual stimulation may reduce the level of disability. They pose little risk to your baby and may help. You should ask your baby's nurse, doctor or occupational therapist about this. 1. Vermont Oxford Network. Vermont Oxford Network 1997 Database Summary. Burlington, Vermont, 1998. 2. Stevenson DK, Wright LL, Lemons JA, et al. 1998. Very low birth weight outcomes of the National Institute of Child Health and Human Development Neonatal Research Network, January 1993 through December 1994. American Journal of Obstetrics and Gynecology. 1996;179:1632-1639. 3. White-Traut, RC, Nelson MN, Silvestri JM, et al. 1999. Developmental intervention for pre-term infants diagnosed with periventricular leukomalacia. Research in Nursing & Health. 1999; 22:131-43. 4. Pinto-Martin, JA, Riolo S, Cnaan A, et al. Cranial ultrasound prediction of disabling and non-disabling cerebral palsy at age two in a low birth weight population. Pediatrics. 1995;95:249-254. 5. O'Shea, TM, Klinepeter KL, Goldstein DJ, et al. 1997. Survival and developmental disability in infants with birth weights of 501 to 800 grams, born between 1979 and 1994. Pediatrics. 1997;100:982-986. 6. Yokochi K. Clinical profiles of subjects with leukomalacia and border-zone infarction revealed by MR. ACTA Pediatr. 1998;87:879-883. Copyright 1999 NeoQual Corp. All rights reserved.